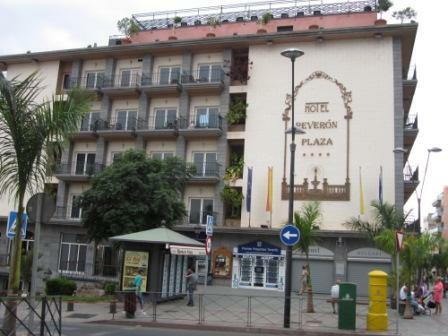 The Reveron Plaza hotel in Los Cristianos is one of life`s little gems. 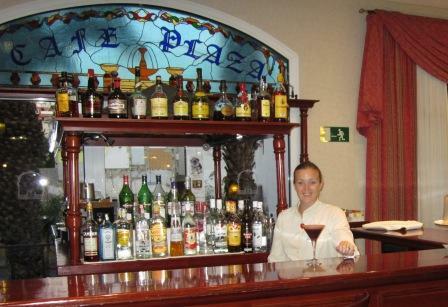 The staff in the hotel make this establishment a great place to stay for your holiday in Tenerife. 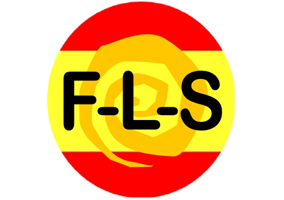 They are friendly professional and helpful people who understand that life is all about doing a good job in whatever capacity they are working. The Reveron Plaza hotel is in an excellent central position in Los Cristianos for access to the beach, port, shopping and restaurants. It faces the Plaza Carmen which is a hive of activity most of the day, but when it gets late, everything quietens to a peaceful end of the day. Easy to find and convenient for the taxis, Hotel Reveron Plaza is found at the head of the pedestrian precinct of Callle General Franco. The welcome at reception from Elena, an undergraduate in tourism studies, is with a smile! 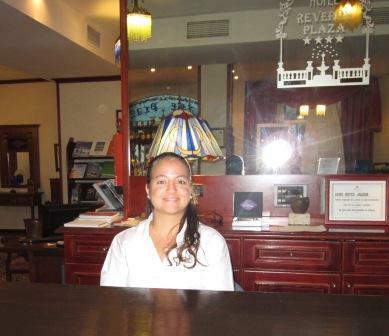 She and her colleague, Yaiza, set the scene for the high standard of service at Hotel Reveron Plaza. On arrival you are quickly and professionally welcomed to the hotel, with help on all the initial details on your stay. This is such an important start to your holiday and time in the resort. May be the relatively small size of the hotel, at only 44 rooms, makes everything seem a little more personal than some of the larger establishments. 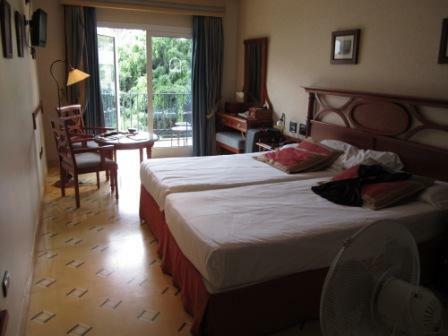 The air-conditioned rooms are exceptionally spacious with tiled floors and rich wood finished furniture. The en-suite bathrooms are also a good size with all amenities like hair-dryer, accessories and cosy thick towels. All rooms have good sized balconies with table and chairs. In October, the rooms overlooking Carmen Plaza have a great view of the effect of the sun rise and sun set over Chayofita mountain! However untidy you are, you can rely on the camareras to restore your room to elegance on their daily visit. 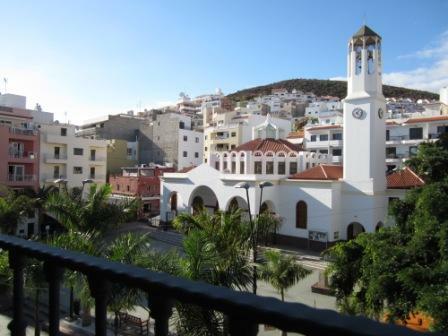 The view from one of the balconies overlooking the pretty Plaza Carmen. Mount Chayofita is in the background hidden by the modern developments perched on the hillside. 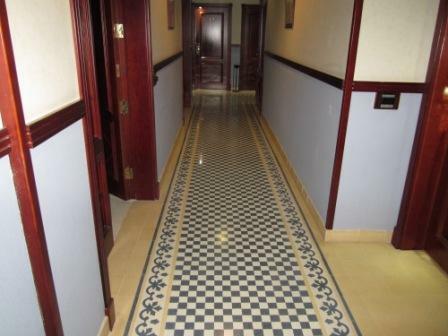 The general elegance of the hotel extends throughout the very corridors, with smart traditional tiling. All public areas are kept spotlessly clean by the professional camareras. Decoration is plain and tasteful with a rich finish to all doors and rails, which are clearly shined with some pride. Every visitor is welcomed by Caroline in her bar to a complimentary drink on the house. Throughout your stay, you will find an interesting selection of `happy hours` to try: cocktails; sangrias; whiskies; brandy; house wine; and lots more! Caroline speaks excellent English, Spanish (of course) and French (well, she is from Belgium). If you know more than one language, take care not to start mixing them too much - it could be very confusing! 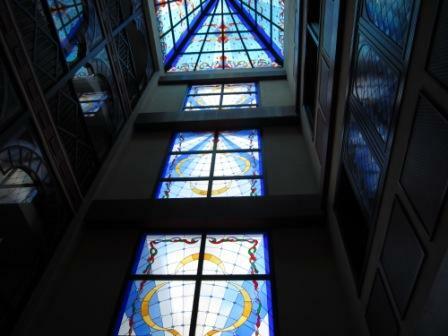 At the top of the central landing of the hotel is the most stunnning atrium which casts a glow over the entire staircases. I am not sure what the styling is, but it is incredibly impressive. Does anyone know what the story is? 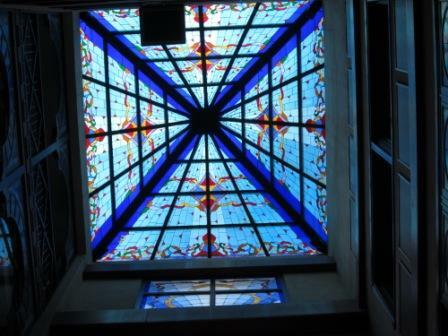 There are also matching coloured windows up the entire ascent of the central atrium feature. I cannot think of anywhere else with such a fantastic feature.